Rethinking the inside of the dishwasher. Basic idea for this project was to make the interior and the process of loading the dishwasher more pleasing and intuitive at the same time. 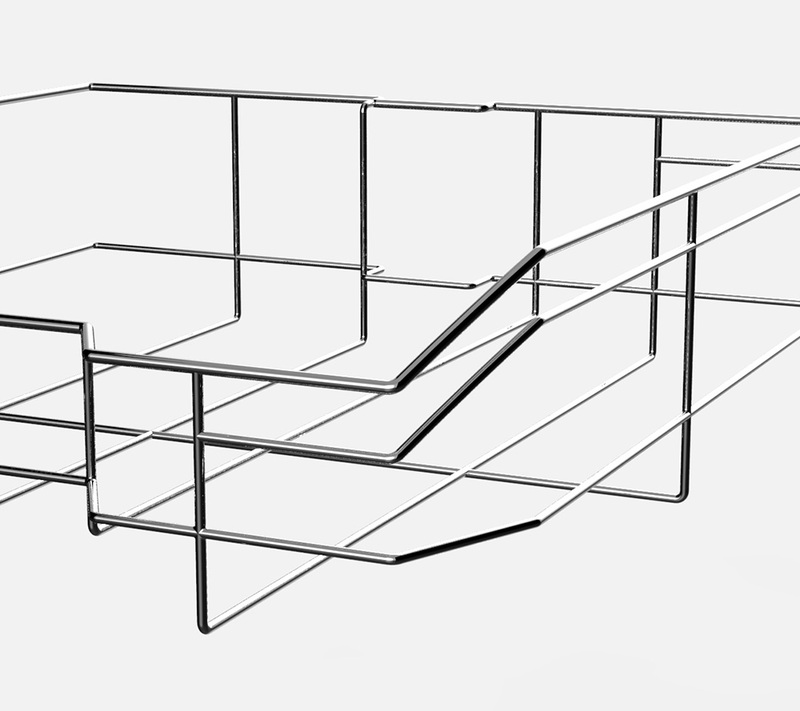 Given that nowadays a dishwasher is designed very functional already, we didn't want to change much about form, but make it more homogeneous and less additive. Therefore we reduced the elements to simplify the whole frame and smoothened the joints and transitions. At the beginning we thought about marking every possible position for each type of tableware with a specific colour. But making this comprehensible for the user would have required an instruction manual. So we reduced the concept to a few zones for certain groups of tableware. The areas are now clearer and enable an intuitive as well as an individual sorting. 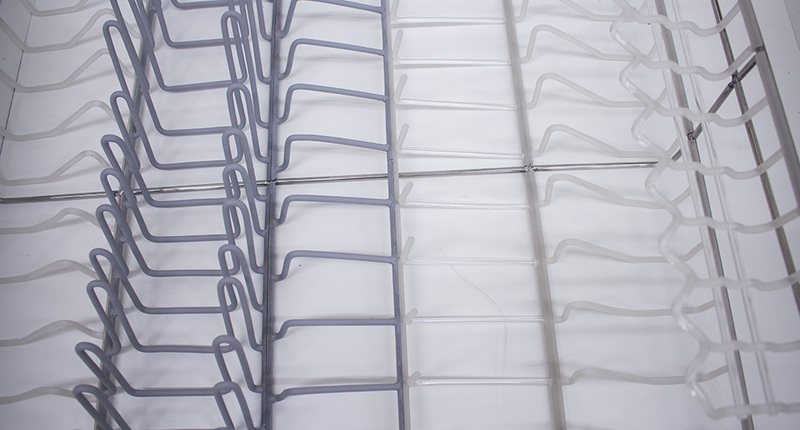 In order to attach the plastic elements to the metal frame, we manufactured plastic inserts, which can be clamped between the metal braces through half-pipes on both sides. 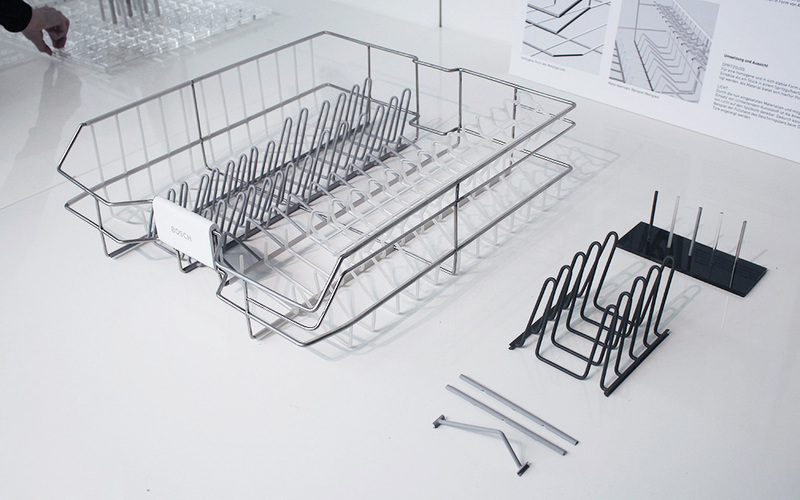 MODULARITY: Another advantage of the inserts is the possibility to exchange them and thereby customize your dishwasher baskets. INJECTION MOULDING: For the final production the plastic inserts would be injection moulded as one piece, which generates a homogeneous and stable form. An appropriate material for this process and use could be polyamide. LIGHT: The possible use of light-guiding plastic allows us to think of an integration of light as well. Light could, for instance, be used for indicating the remaining loading capacity of the dishwasher when opening it.